Texans’ defensive front won the battle against the Colts’ offensive line in 2018 | Bring Your "A" Game Sports Talk! As the Texans prepare to face the Colts for the third time this season in today’s first wild card game, there’s one area in particular where they can feel very good: Their defensive line got the better of the Colts’ offensive line in both regular-season games. Although the Colts’ offensive line was much improved this season, thanks in large part to the arrival of the great rookie guard Quenton Nelson, they struggled against the Texans’ defensive front. 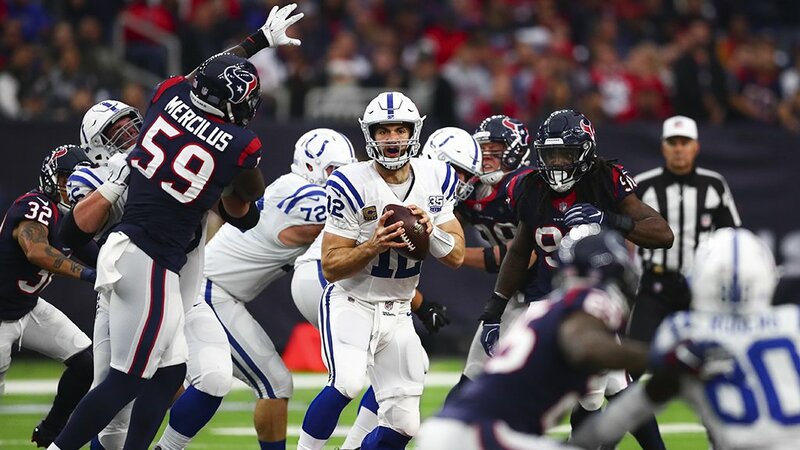 In the first game against the Texans, Colts quarterback Andrew Luck was sacked a season-high four times, with J.J. Watt and Jadeveon Clowney getting two sacks each. In the second matchup, Luck was sacked twice. Luck was only sacked 18 times all year, the fewest sacks in the NFL, but one-third of those sacks came courtesy of the Texans. Running the ball, the Colts consistently struggled to create holes against the Texans’ defense.